The species Millerelix simpsoni (Pilsbry and Ferriss 1907) is a complex species when it comes to research because it has been classified in various ways based on its characteristics and behavior. The species has also been renamed quite often over the years because of new discoveries. One of the previous names was Polygyra dorfeuilliana sampsoni, and a look at the classification will show the pathway of arriving at this name. The common name in English is 'Wyandotte Liptooth' (ZipcodeZoo, 2012). This name is suitable because the species has this physical characteristic, and it is found in Wyandotte, Oklahoma where shells are slightly heavier than those found in Eureka Springs, Arkansas (Pilsbry, 1940). Millerelix simpsoni was also difficult to name because it is very spread out among the South-Central United States. So, all these mollusks were being found in very distant places, but they all seemed to share a fairly similar habitat. Most of the physical characteristics for all Gastropods are the same, so it is not plausible to name and classify them based only on these exterior characteristics. Taking close observations about the Millerelix simpsoni nutrition has helped in identifying the family in which it belongs. Also, the species' reproduction and the structures associated with it assist in determining the proper classification. 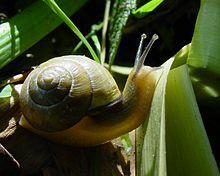 If you are still curious about the many other snails in the Phylum, feel free to browse the Wisconsin Land Snails webpage. There is also much more out there to explore than Mollusca, so check out the Multiple Organisms webpage. If you have any questions or concerns, please refer to the contact webpage.